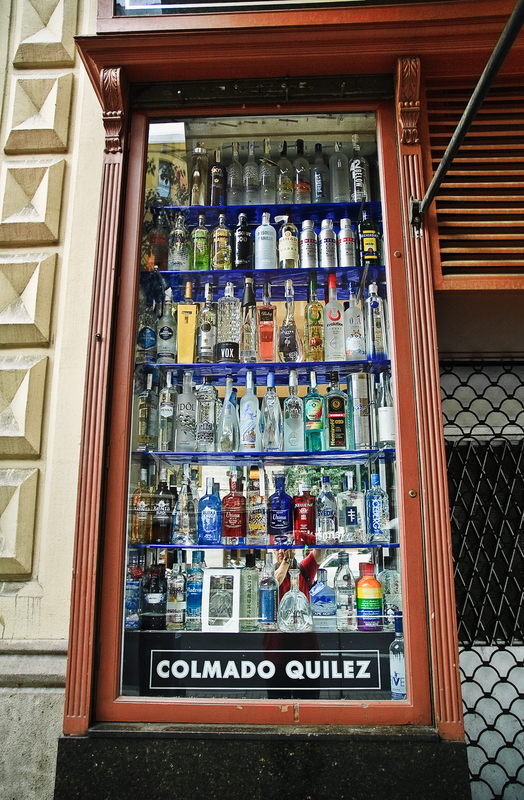 Vodka bottles of different brands beautifully arranged inside one of Colmado Quilez's window displays at Rambla Catalunya, 63, Barcelona. In fact, they have 110 varieties of vodka on sale in an adjacent store. I have chosen this grocery store image, first of all to show you the place described in the link above and second but not least, to make an imaginary toast with you, all those visitors that give Barcelona Photoblog a reason to exist, that compensate for all the last four years of hard work, of late night efforts, of roaming the streets in search of unusual sights, of candid shots, of street photographs, of Catalan art, of traditions and whatever subject that brightens up your existence for a minute or two. Stats are just relative numbers and have to do with vanity, with competing with our peers in a way but they also have to do with self assurance and recognition. One or two days ago, Barcelona Photoblog reached the magic figure of 1.000.000 visits in four years and what better than sharing some virtual bottles of vodka with you. Here's to your health, cheers! I'll raise a glass to that - many thanks for an interesting forum, wonderful photos, and the gift of a "mini-vacation" for your readers. ¡Salud! Felicitaciónes, Carlos. You clearly have fans out here in cyberspace. Que continues. Hey! Congrats for your blog and all the visit you got!! Would you like to participate in a photo contest on Facebook about barcelona? Concratulations upon this achievement ! Please have a wonderful Friday. I'm sorry that I rarely comment and don't express my appreciation but I just wanted you to know that I love my daily 'visit' to Barcelona via your blog. It is my favourite web site and I think that your work is stunning. As well as the photographs, I also enjoy your commentary very much and I hope that you never stop doing that. It helps make this site truly unique. Long may Barcelona Photo Blog continue. congratulations on creating such a wonderful site.